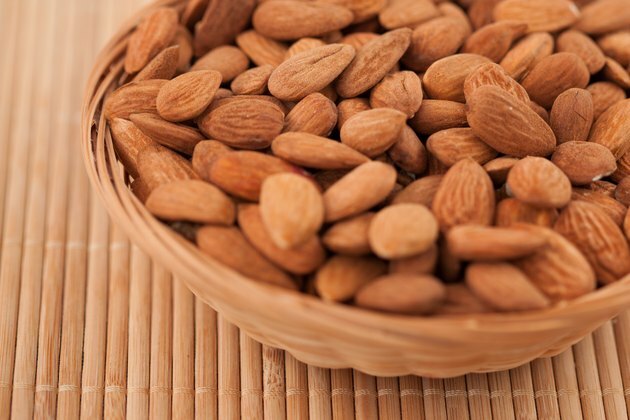 A handful of almonds is a tasty, portable snack that doesn't require refrigeration, which can make these nuts convenient to eat following a workout. However, while almonds are healthy for you, they may not be ideal for a post-workout snack due to the lack of certain nutrients. Almonds can be a poor choice for a post-workout meal for dieters, as the nuts are calorie-dense. A 1-oz. serving, or about 23 almonds, provides 163 calories -- about 8 percent of your total calories, based on a 2,000-calorie diet. Such a high calorie content could negate your workout; it would take 45 minutes of weightlifting to burn off the calories in 1 oz. of almonds. However, if you are working out to build muscle and want to gain weight, the high calorie content of almonds can be beneficial. Consuming adequate levels of protein after your workouts is crucial for muscle recovery, so almonds may not be an ideal choice. A 1 oz. serving of almonds contains just 6 g of protein, 2 g less than a cup of milk provides. According to research published in the December 2010 edition of "International Journal of Sport Nutrition and Exercise Metabolism," you should consume 20 g of protein after your workouts for optimal recovery. Another important element in post-workout recovery is carbohydrate intake. Almonds are also quite low in carbohydrates, with just 6 g per serving. According to nutrition researcher Dr. John Berardi, you should consume .8 g of carbohydrates per kilogram of body weight in your post-workout meal. If you weigh 160 lbs., this amount would be 58 g of carbohydrates, so you'd need nearly 10 oz. of almonds. Almonds are rich in fiber, with 3.5 g in each 1-oz. serving. This nutrient is beneficial for overall health but not ideal for post-workout meals, as it can slow down absorption of nutrients your body requires for recovery. Almonds also keep blood sugar levels stable and may aid in managing your cholesterol level. Almonds are rich in dietary fat, with 14 g in each 1-oz. serving. Although this fat is primarily healthy fat because it is unsaturated, this can be detrimental for post-workout consumption because fat, like fiber, slows digestion. However, maintaining adequate levels of fat in your diet does offer benefits. Research from the November 2004 edition of "International Journal of Sports Medicine" indicates that reduced fat intake is associated with lower testosterone levels.